This article is part of our special report Special Olympics 2014. 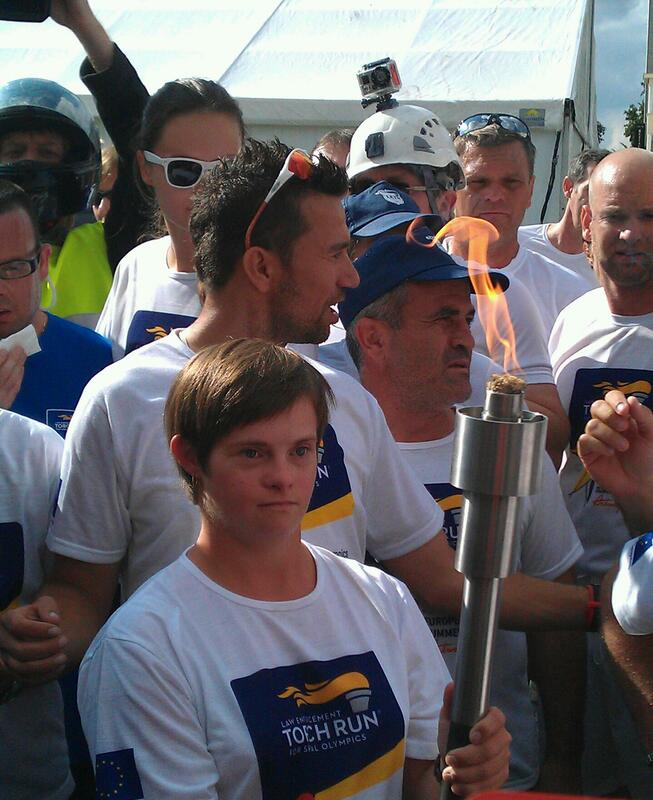 The torch carried by intellectually disabled athletes stopped in front of the European Parliament, where EU Council President Herman Van Rompuy and a dozens of parliamentarians met the participants. The EU’s €1.7 million contribution to the event came under question because of cuts in the EU budget due to the crisis. But Katheleen Van Brempt, a Belgian member of the European Parliament, campaigned against the reduction of the budget and managed to maintain it intact. “This is an event that for many is nice to have instead of must have,” she said before the torch arrived. Van Brempt also said that while there is a big awareness campaign with many celebrities promoting the event, it is not enough to achieve social inclusion for people with intellectual disabilities. Jens Nilsson, another member of the European Parliament present at the arrival of the torch, said it is a matter of showing solidarity for such causes. Nilsson, a former mayor in Sweden, tried to bring the Olympics to his town many times. He said politicians should do their job at local and European levels, in order “to support activities where people come and work together for social inclusion”. While financing social inclusion activities could prove challenging, the Italian MEP, Brando Benifei said “we can find the money”. Benifei referred to the new Commission President-elect promise to find €300 billion from public and private investments to restart growth and rebuild the communities. The torch run, a 450 km long route, will take the flame through 17 Belgian cities for five days. The final destination is the opening ceremony in Antwerp on 13 September. When the flame arrived in front of the parliament, it was passed to Julie Bourgeois, a 26-year-old special Olympics athlete from Belgium. “It is the first time I am carrying the Olympic torch and I am very proud of it,” she said. Bourgeois participated already five times in Special Olympics and won five medals. She said the games changed her life and she made many friends during the competitions. Bourgeois is one of the hundred athletes who accompanies the torch through Belgium. Volunteers without intellectual disabilities could also participate in the run. The special Olympic games invite all interested to carry the torch for a sub run in exchange for a donation to support the intellectual disabled contestants. Over two thousands intellectual disabled athletes are participating in the Special Olympics games from 2-20 September in Belgium. The European Special Olympics Summer Games are organised by Special Olympics (SO) every four years in a major European city. SO is one of the biggest sports organisations for people with intellectual disabilities. It provides year-round training and competitions for more than four millions athletes from all around the world. These activities are meant to get together people with and without intellectual disabilities and to give them the opportunity to be involved in physical activities and competitions. The European Commission has been supporting sports events as a way to promote social inclusion through projects like "Youth Unified Sports" or Sport Preparatory Actions. Why do these games have ride on the coat tails of the proper Olympics? We continually see this misappropriation of previously elite branding across many fields; further evidence of the general dilution of the concept of absolute excellence, perhaps?